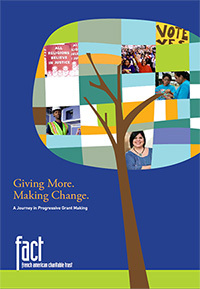 FACT's mission is to empower individuals to act together to improve their lives. Its method is building the organizational strength of groups so they can work effectively. The organizations we support employ a variety of methods, but at the heart is the desire to empower and give voice to people. FACT had always paid out more than the normal five percent in grants each year. When the Board made the formal decision to spend down in 2004, we had a lot of years to plan our spending down as effectively as possible. We were able to double our grants and bring seed funding to a capacity building project that would help strengthen not only our grantees, but other community-based organizations as well. There is currently a growing interest among small family foundations and foundations started by entrepreneurs in the idea of spending down. For entrepreneurs, this means being able to take more risks with their money; for small family foundations like ours, this means being able to see more impact in our lifetime because we are giving away more each year as opposed to staying within an arbitrary ceiling of five percent. This trend, however, does not exist within the larger, private and more conventional foundations that are concerned with being in existence in perpetuity. My very first site visit to the Louisiana Bayou was when I was most influenced regarding what kind of philanthropy I was interested in doing. I decided to support community organizations that prioritized building the leadership and skills of their membership so they could have a voice in issues that concerned them. There is not a single theme that these groups work on, rather they help elevate the voices of those who are voiceless and powerless. Have you ever been met with resistance or criticism to the specific style of funding we asked you about? What specifically were the concerns, and how did you respond? Some of the criticism I heard was that we were giving small amounts of money to small groups that wouldn’t ever change policy or have a large impact. In actuality, many of our grantees had many victories including legislative, policy and electoral in their own communities, some at the statewide and even national levels. In order to effect change, you need an energized, educated and empowered voice and that’s what our groups did. Some of our challenges in the beginning had to do with trying to fund too many groups in too many areas. Five years into our funding, we reduced our grantees and gave them larger pools of money and encouraged them to work together across sectors and regions. This helped propel their efforts forward. Foundations often spread themselves too thin, so it’s better to come up with a specific mission, a funding objective and a plan for how to reach that objective. You can always revise, but you need a road plan when you are starting out. The decision to spend down a foundation necessarily involves a lot of strategic thinking around impact and effective use of funds. In addition, by increasing your budget, you can see the results of your funding much earlier than a foundation that gives only a little bit of money over many years. Spending down is not for everyone. However, even if you don’t want to spend down, the exercise of thinking about impact, effectiveness and how to leave something behind is a really great one that all foundations should embark upon.